Fresh experiences, fresh adventures and a fresh approach to life: that's what Brisbane is all about. It's a city where the air is filled with optimism and a sense of adventure is heavy on the ground. You'll be amazed by the attractions, the diverse places to visit. You'll also be pleasantly surprise by the open and friendly attitude of the locals. Famed for its sunny, sub-tropical climate, Brisbane has a relaxed and sophisticated charm. As well as the superb weather and warm welcome, Brisbane offers a great mix of attractions including the great Australian outdoors, fine dining and a vibrant nightlife, cultural attractions, great shopping & of course some awesome sporting events. The capital of the State of Queensland, Brisbane is ideally located to enjoy the many attractions of the Gold and Sunshine Coasts as well as the Queensland Outback and the magnificent islands which lie off its shores. There are no direct flights to Brisbane from the UK due to the vast distances involved between the two. Take your pick from a superb choice of airlines which fly into Brisbane via the Middle East, Far East or United States with a stopover or transit en route. Explore the inner CBD where glass towers stand alongside beautiful colonial sandstone buildings or head to the riverfront where you can enjoy a relaxing walk along the many walkways. Head to the Southbank for a taste of Queensland culture including the art gallery, museum and theatre. Southbank is also home to the vibrant weekend open-air markets and acres of parklands and tropical gardens where you can dine, cycle, walk and swim. Follow the Brisbane Heritage Trail from the City Hall past the historic sights of Customs House, Parliament House and the Old Government House and marvel at the Queenslander-style homes with their spacious verandas built on stilts. Within an hour of Brisbane you can explore the stunning beaches of the Sunshine Coast, the surf, casinos and buzz of the Gold Coast, head inland for some country pursuits or discover the beautiful waters of Moreton Bay. Moreton Bay is a big draw for visitors and locals alike with its vast expanse of sparkling waters and marine life. There are a vast range of tours and activities to suit everyone from wildlife spotting – look out for dolphins, turtles, rays and even humpback whales – to adventure sports, sailing, fishing or relaxing by the blue lagoon. Explore Moreton Bay’s many unspoilt islands including Moreton Island with its impressive sand dunes and wildlife. Head further up the Queensland Coast where you’ll find the unique Great Barrier Reef and its many beautiful islands, the idyllic Whitsundays and the attractions of the tropical Far North. The most popular times of year to travel to Australia include the main holidays of Easter, the summer and Christmas. To find yourself the cheapest flights to Brisbane, Australia, we advise you to avoid these busy times of year and to book well in advance of your intended departure date. Use our flight search box for the latest offers on cheap flights, low cost flights and for spur of the moment lastminute flights. 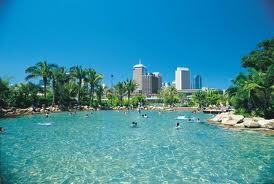 Brisbane has a humid subtropical climate with warm to hot and humid summers and dry, moderately warm winters. From November to March, thunderstorms are common over Brisbane, with the more severe events accompanied by large damaging hail stones, torrential rain and destructive winds.